Sign, light and colour are the elements that I use to play my expressive game. It is an operation that I perform under the sign of grace and lightness, letting the images come out as if from a dream, “the place where the lines of geometry and imagination live together”. The sign outlines the forms, the colour connotes the emotional field, the light dematerialises the vision which only apparently appears unobjective. Thanks to my Mediterranean origins, I could discover the beauty of the light and the infinity of the black horizon line separating sky and sea; all this had inner, mystical and philosophical value. In the my works there is always a part of me, an inspiring emotion: a dream or a thought, past or present, a song or music classical or modern, or simply eternal emotion of the waves. My hand seems to be magically guided by a “superior” desire. I paint in symbiosis with the canvas, while the external world becomes strange to me… My ideas are expressed as a synthesis and I immortalize my memories on the painted surface so that the observer’s interpretation can bring them back to life. All my work could contain a message, but I leave to each visitors of my works to see what they prefer. It, for me, is main point create an emotion, not a particular message, I'm happy when anybody tells me that a my picture has given to him an emotion. …maybe I paint what we know to be existing, but we do not really see, in the form of synthesis and actual thought. Light is life. I find always new and insightful stimuli from light and the luminescence is the access to my work through a complete participation. 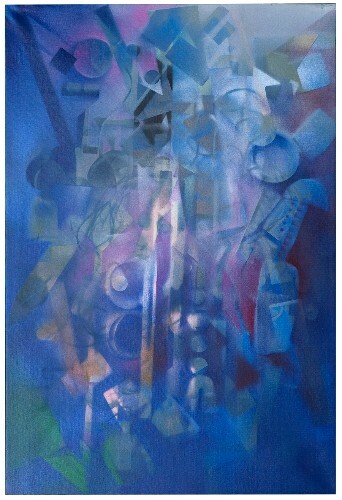 I love use oil on canvas, but I work much with watercolours and/​or tempera on paper, and I love work for etchings. Many of my etchings are painted, after printing, in watercolour. 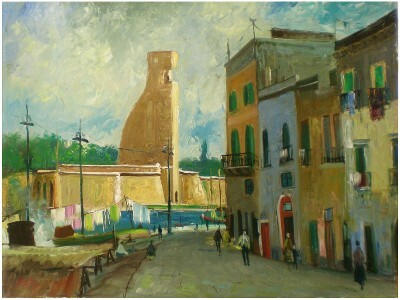 (Painter/​Engraver) Vincenzo Balsamo was born in June 1935 in Brindisi, Italy. He lived in Rome, Paris, Verona, now he lives in Corchiano, Italy. He studied at the San Giacomo Art School, Rome. Main exhibitions took place at Palazzo delle Esposizioni, National Gallery of Modern Art, X National Quadrennial, Chiostro del Bramante - (Rome); European Biennial - DUBROVNIK; Découvertes Nef Victor, Carrousel du Louvre - (Paris); "Santa Apollonia" Art Center Venezia, Nagahama Museum - (Japan); Museum of Modern Art - Arezzo; Matalon Museum - Milan; 4th Beijing International Art Biennial; Modern Art Gallery - Cento; Lu.C.C.A. Center of Contemporary Art - Lucca; A.C. Art Museum Beijing, Yixing Art Museum, Guangzhou Mayland Art Gallery, European Commission - Brussels; Art Fairs: Shanghai, Miami, New York, Canton, Moscow, New Delhi, Los Angeles, KIAF, Beijing, Toronto, In Arco, London, Bologna; Milano, Torino, Verona, etc. 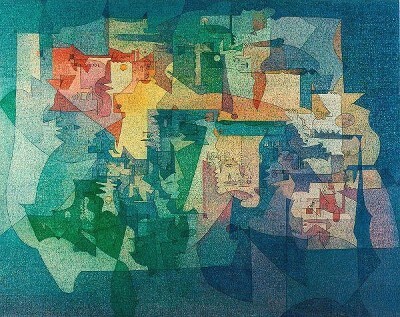 ; and several participations in biennial/​triennial of print. Vincenzo Balsamo paints since the fifties. His first artworks are figurative paintings. They regard Italian landscapes (Tuscany, Umbria, Lazio, Campania) particularly intense and intimate where the pictorial technique, composed by vibrant brush strokes, delights in a sort of play of fantastic tonalities. During the seventies Balsamo stops painting figurative works: It is the so-called “first abstraction” period where he actually returns to the coloured background of the landscapes, but without a hint of figuration and separated by a black sign that becomes the texture of the memory. During the late seventies Balsamo researches and experiments. 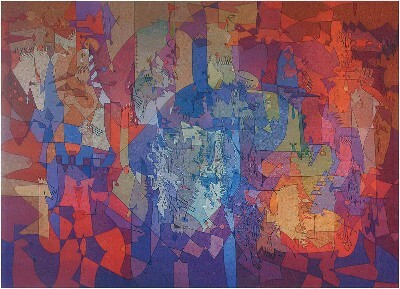 Decomposizioni (Decompositions) (1975-76) are informal, material, full bodied works, harsh in their pictorial expression. 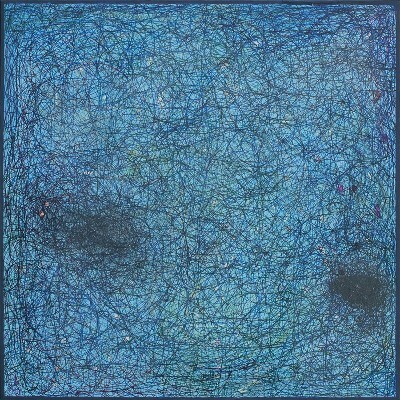 Nebulose (Nebulas) (1977-78) are not envisaged as a celestial world, but as a mental and internal journey in search of the right balance between the gestural mark and - alongside and upon - the colour. 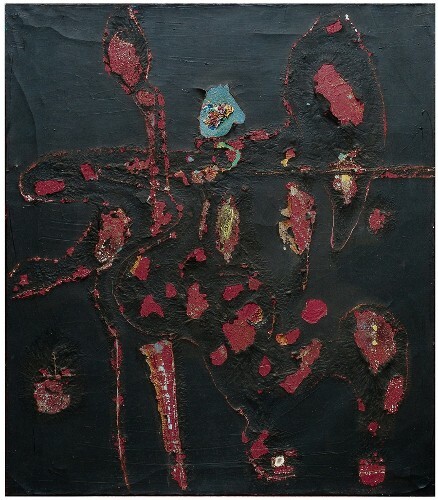 Evocazioni (Evocations) (1978-79) are complex and introspective works characterized by strangely deformed, surreal and fantastic figures, symptoms of weariness and doubt. 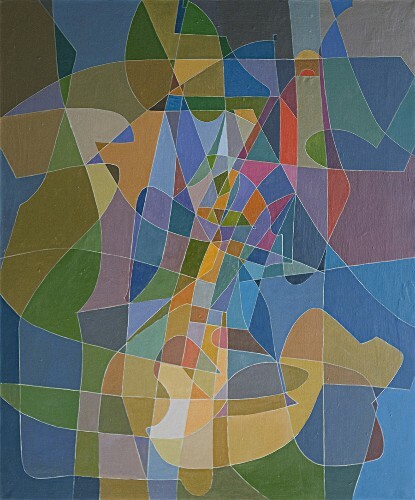 In the early eighties Balsamo strives to regain his expressive thought and spends time at his easel in order to rediscover a new, more congenial world. 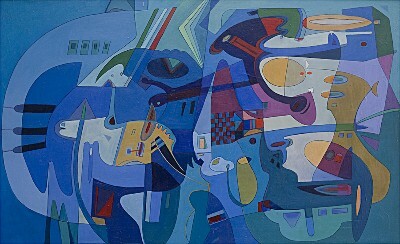 It is the so-called “second abstraction” period and he paints works inspired by an abstract-cubistic concept. In 1987 begins the “Lyrical Abstraction” phase where the sign, the colour and the light are made up among them as if they would peer into the human "I"